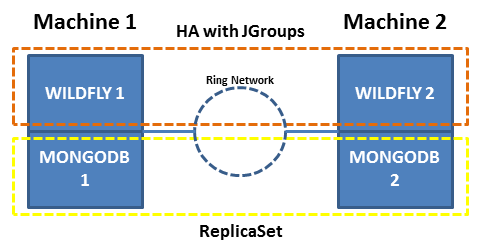 I have two machines connected in a ring network, each one running Wildfly in HA mode using JGroups ant MongoDB in HA Mode using Replica Set. The machine 1 is the primary and machine 2 is secondary. Whenever Wildfly 1 drops, Wildfly 2 raises by reconfiguring MongoDB 2 to be primary by changing the settings of the ReplicaSet. We know that the Replica Set does not work by itself with two machines, but we have this limitation. If a split occurs on the network, Wildfly 1 continues to work writing in MongoDB 1, Wildfly 2 is also active, changes the MongoDB 2 configuration to primary, and begins writing to it. We are using version 3.6.5 of MongoDB. What happens to MongoDB when reestablishing the network and Wildfly 1 take over as principal? MongoDB 2 will continue as a primary but Wildfly 2 will be stopped? MongoDB 1 will be able to merge with MongoDB 2? Considering that MongoDB resolves by doing the merge, what happens if the MongoDB 2 OPLOG passes the size specified in the configuration? Does he go back to the beginning (like a car odometer)? If your goal is high availability with automated failover I would definitely aim for a solution that does not involve reconfiguring the replica set or allow for the possibility of multiple active primaries. Ideally this does require a third machine so you have a tie-breaking vote to allow either MongoDB 1 or MongoDB 2 to become primary in the event of a partition between the two. The third machine can either host another secondary (recommended) or a voting-only arbiter (not recommended for HA as it cannot contribute to majority write acknowledgement). If MongoDB 2 is a secondary, this scenario only works if you force reconfigure (since a majority of voting replica set members are not available). and do not use force when there is still a primary. A primary can only be elected or sustained in a partition with a majority of voting members. With only two voting members, a network split will result in the current primary stepping down (since it can't see a majority of the voting members) and no primary elected. If MongoDB 1 accepted any writes that were not replicated to MongoDB 2, MongoDB 1 will enter rollback mode to try to revert write operations to a common point in the oplog. If too many operations have been written on MongoDB 2 or MongoDB 1 no longer has a common point in its oplog, MongoDB 1 will have to be resynced. If both of those stages are successful, MongoDB 1 should be eligible to become primary. MongoDB 1 won't automatically become primary unless it has a higher priority than MongoDB 2. Not the answer you're looking for? Browse other questions tagged replication mongodb master-slave-replication mongodb-3.6 master-master-replication or ask your own question. Does a replica set with only two machines make sense?